I was not that keen on reading The Book Thief when I first heard about it. One reason, and this is quite contrary of me, I know, is that people were raving about it and that always makes me wonder whether a book can really live up to its reputation. The other reason was that I had the impression it was about the Holocaust, concentration camps and the Nazi persecution of the Jews and I would find it too heart-rending. Then I gave in and thought I’d better read it to see what all the fuss was about. It had been sitting on the book shelves unopened ever since I bought it until it was chosen as the next book to read in Cornflower‘s on-line book group. Death is the narrator of the book. Oddly enough, I became fond of this character, Death, as the story progressed. Death is compassionate, commenting on man’s inhumanity to man and he is very overworked. The action takes place in Nazi Germany and there are some very moving, tense and emotional scenes. Overall though, the book is about ordinary German people and their experiences during the war, their reaction to the Fuhrer and their efforts to help their Jewish friends and acquaintances. As I was reading about how they survived during the air raids I was comparing it to how the British also coped as described in Our Longest Days. As you would expect, it was much the same. People in both countries suffered. 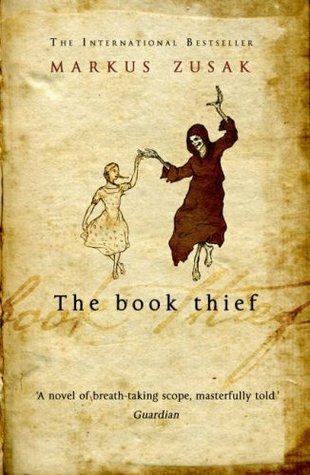 The “book thief” is Liesel Meminger who is nine at the start of the book in 1939. On her way to live with foster parents, Rosa and Hans Hubermann, she witnesses the death and burial of her brother and finds “The GraveDiggers Handbook”. This is the first book that became very important to Liesel. Her love of words leads to her acquiring more books with the help of her friend, Rudy. She steals a book from the Nazi book-burning fires and from the local mayor’s library, with the assistance of the mayor’s wife. The danger increases for Liesel and the Hubermanns when they shelter a young Jew, Max Vanderburg, in their basement. Liesel’s relationships with Rudy, Hans and Max are central to the story, as Death almost seems to stalk them. Terrible things happen in this book; the Nazis and the Hitler Youth Movement cast their sinister shadow, the people are starving, Jews are persecuted, people are whipped for helping them, and towns and cities are bombed and devastated. Although this is a long book I read it very quickly; it is an easy book to read. The language is simple and straight forward. Some of the sentences are very short, almost staccato and fragmentary: “Door open, door shut. Alone again.” “The food.” “The carrots.” “I know. You know.” This jarred on me a bit but I suppose that writing like this does make the book easier to read and I was able to read it in just a few sessions. Still, I thought it was a disturbing, unsettling book and I found myself reading it completely absorbed in the story. It also made me think of The Diary of Anne Frank, which she wrote whilst in hiding for two years with her family during the Nazi occupation of the Netherlands. Her family was apprehended in 1944 and Anne Frank ultimately died of typhus in the Bergen-Belsen concentration camp. This is a heartbreaking account. If you haven’t read it you really must! I keep meaning to read this also. I know that so many have and loved it. It seems strange that it is a Youth Fiction book, but so is the THE DIARY OF ANNE FRANK. Don’t think I will take this one on vacation but I may see if I can get to it later this summer or in the fall. Thanks for a nice review, Margaret. I think The Book Thief was probably my favourite book of last year. I was captivated by its humanity and really liked the style in which it was written. I read Anne Frank when I was a teenager and recently bought a new edition of the book so a reread is on the cards before the end of the year. It’s one of those books I feel everyone should read. Opinion really seems to be polarised on this book – some have loved it and others loathed it and couldn’t finish it. While the style didn’t grab me, the story certainly did, and the picture of wartime life in Germany was fascinating. What a great review of this book. I think that you captured it all nicely. I read this one earlier this year and was utterly captivated. I walked into it not really expecting much….I thought that they hype was just that…and that as with Meyer’s book Twilight I’d end up being disappointed. Instead I found this book to be among my top choices of books read so far this year. Thanks for your comments. I really must re-read Anne Frank’s diary soon whilst The Book Thief is fresh in my mind. Cath I think it’s the humanity of the book that appealed to me and I agree with Cornflower that it is a fascinating view of life in wartime Germany from the ordinary person’s viewpoint. Gail, you put your finger right on the spot for me – I didn’t want to be disappointed and although I was with the style, luckily not with the story. I’m one of those who loved this book (at a time when I didn’t realise so many others did too), because of its poignancy and Zusak’s wonderful use of language and original narrative style. I then went on to read his other work (mostly young adult), and became even more impressed with his technique and way of viewing the world – and telling a story. It wasn’t until I started blogging last year that realised how much The Book Thief had polarised people (simply, I guess, because of its popularity and number of reviews). I’m glad you liked it! Glad you gave in and read it! I very much enjoyed the book and still think about it from time to time even though I read it a year ago. I FINALLY got my review (such as it is) up on my blog this morning. I’ve been so bad lately keeping up with reviewing. I absolutely loved this book. It still haunts me. I found Anne Frank’s diary so absorbing – and can recommend Melissa Muller’s biography of her too. Obviously Anne’s diary is incredibly moving, but it also very well written, and offers signs of the writer she might have become.